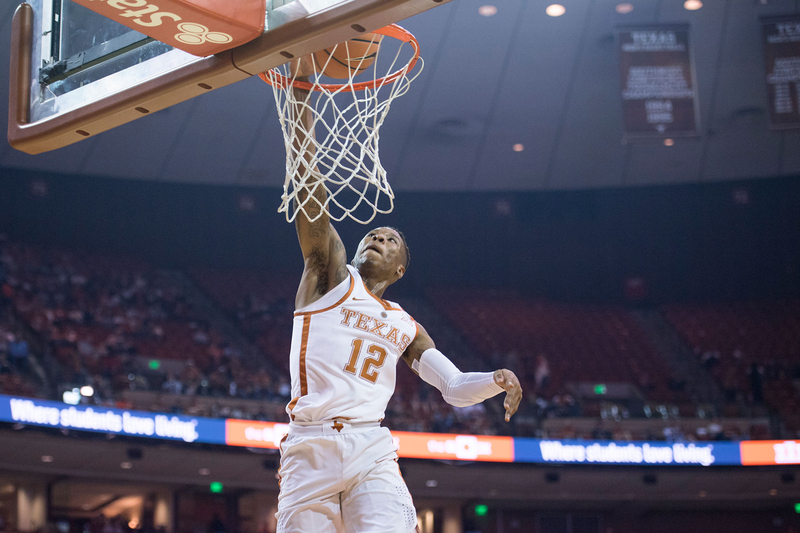 Guard Kerwin Roach scored a team-high 21 points to lead the Texas men's basketball team to a 78-76 win over Xavier in the second round of the NIT (photo courtesy of texassports.com). AUSTIN, Texas — Senior guard Kerwin Roach scored a team-high 21 points to lead the University of Texas men’s basketball team to a 78-76 overtime win Sunday over Xavier in the second round of the National Invitational Tournament (NIT) at the Frank Erwin Center. With the victory, the Longhorns improved their record to 18-16, while the Musketeers’ season ended with a record of 19-16. Texas will advance to the third round of the NIT, and will host the winner of Monday’s game between Colorado and Norfolk at 8 p.m. Wednesday. The television network that will carry the game has yet to be determined. Roach was 6-of-13 from the field, nailing both of his three-point attempts, and pulled down eight rebounds while handing out six assists. He was joined by three teammates who turned in double-digit scoring performances: guards Courtney Ramey and Jase Febres each tallied 17 points; Febres shot 5-of-8 from three-point range, while Ramey added a career-best eight rebounds. Sophomore forward Jericho Sims also scored 11 points. The game only went to overtime when Xavier’s Quentin Goodin missed one of two free throws with two seconds left in regulation. In the extra session, Texas claimed a four-point lead, at 77-73. A free throw by Xavier’s Tyrique Jones, who scored a game-high 22 points, closed the margin to 77-76 with 50 seconds left, after which a free throw by Roach stretched the UT lead to 78-76. The Musketeers misfired on three shots in the final four seconds, to preserve the Longhorns’ victory. Texas hit 11 of 23 shots from behind the three-point arc, improving its record to 10-4 in games in which it connects on 10 or more three-pointers.